St. Matthew Parish is expanding and improving how all of us can support and participate in the Adoration of Our Lord in the Most Blessed Sacrament. parishioner is asked to help our parish perpetually adore Our Lord. Please say yes to Jesus’ call to adore Him in prayer, in the real presence of Jesus in the Eucharist! Adoration and allow many more people to participate, to make adoration truly perpetual: Jesus is never alone! Please take a minute to explore the We Adore Him page and see how it will work for you. Questions?? 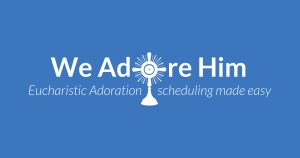 Email us at adoration@stmatt.net.